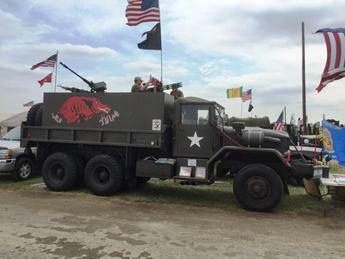 I was very lucky to be able to return to USA to meet up with some veterans of the 129th at Kokomo, Indiana. 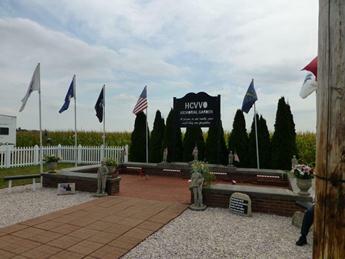 The Howard County Vietnam Veterans Organization was formed in 1981, originally to raise funds for a memorial to those lost in the Vietnam conflict. 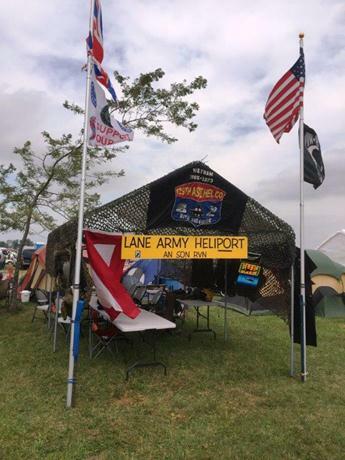 Once they had achieved that, the members arranged a hog roast to celebrate and that has now grown to a huge annual event where Vietnam Veterans and their families can meet and socialise for a long weekend. 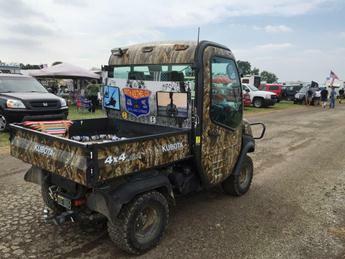 The organization has collected enough funds over the years to buy a 40 acre site near the town of Kokomo, Indiana. They call the site “The healing fields”. On the site are a memorial and a wall of honour. 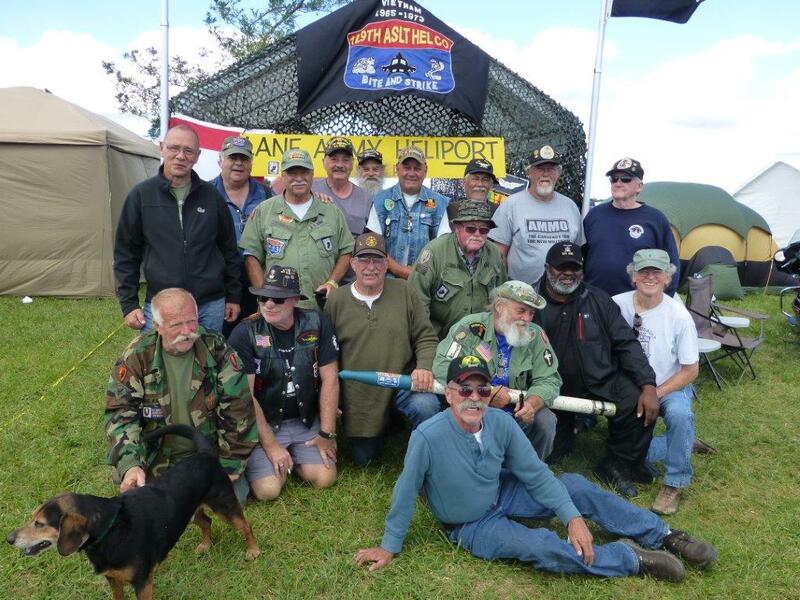 This year was the 33rd Annual Reunion and, significantly, the 50th anniversary of the end of the Vietnam War. I was fortunate enough to be able to go in 2010 with my wife, Jo, Simon and Bradley when we had an amazing time! This year the opportunity came up again and I leapt at the chance to go and visit and meet up with some old friends! It felt like an honour to be invited to spend time with so many veterans and to meet members of the 129th Assault Helicopter Company, which our Huey 509 served with. So on a wet and windy morning I flew out of Manchester Airport, having purchased a few bottles of single malt whisky in the duty free to share with Ron! After a long flight, I arrived at Indianapolis airport to be met by Ron. It was great to see him again and we headed off to our hotel to catch up over a whisky or two! The following morning, Ron drove us to Kokomo where I had a rather emotional reunion with the 129th members and their families. Some I had met before, others I hadn’t. I couldn’t begin to name everyone personally, but it was especially great to see Mark Jackson again. 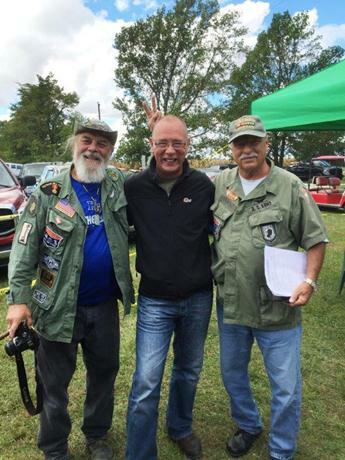 I first met Ron and Mark and their fellow veteran Fred Alvis, in 2007, when they came to the UK to be reunited with Huey 509, and have kept in touch since. I was made very welcome by everybody. They had even put up the union jack flag in my honour! We talked and talked for hours, catching up with news, laughing and joking, and drinking more whiskey! The site is enormous! 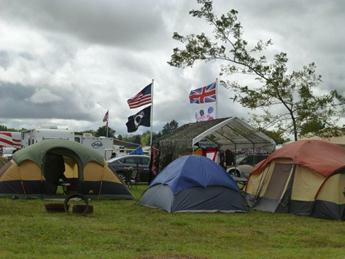 All the different units set up a “base camp” consisting of a communal tent and a camp fire, around which everyone sets up their camp-tents, RV’s motor homes, pickups, Harley Davison’s and the like! 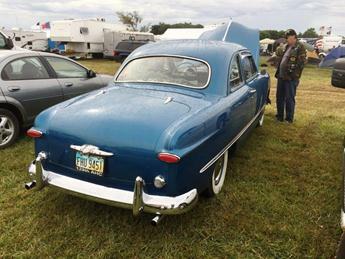 Mark had brought his 1949 V8 Ford side valve car. Very nice! 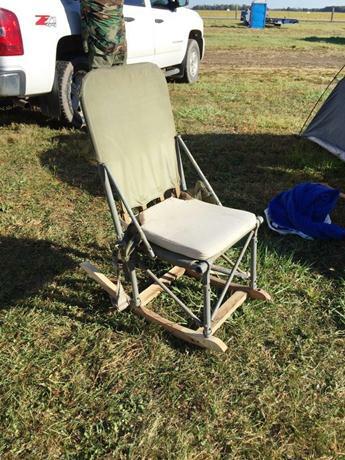 He also brought along his Huey Rocking chair! I was so impressed with it that I have started to make one for myself!! We were joined by members of other units too, and the conversation usually revolved around Vietnam; where they served, people they knew and people they had lost. I heard some very moving accounts. These veterans have had difficult times since coming home, some worse than others, and this reunion is an opportunity for them to be with people who understand. I was amazed by the number of people who knew who I was and what we do with Huey 509 here in the UK. They are genuinely grateful that we have managed to keep a part of their history alive. I feel very privileged to be able to do so. 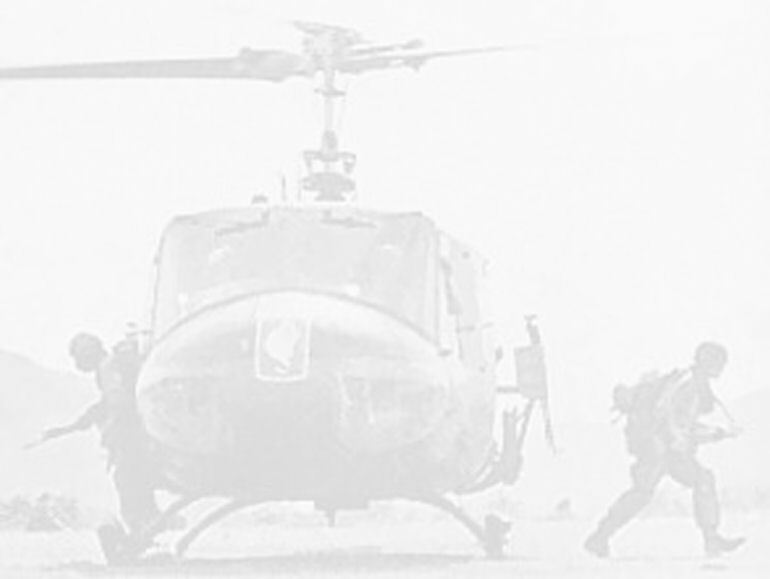 Throughout the four days, the constant iconic sound of a Huey could be heard flying 100 feet overhead. Two helicopters, operated by www.americanhuey369.com were flying passengers for a 10 minute flight, giving them an incredible view of the site. 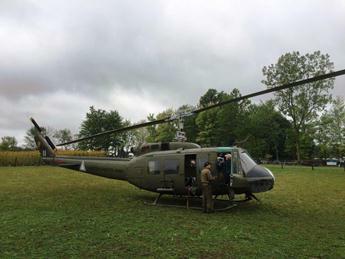 Some of the passengers had not been in a Huey since they served in Vietnam. This event could not have been a better place for them to relive their experiences. 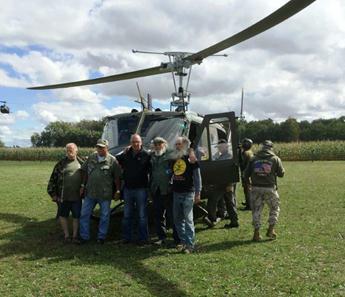 One of the highlights of my trip was being allowed to fly “Huey 803” along with Ron Paye. 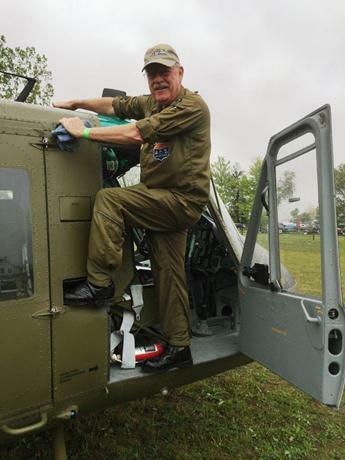 Ron flew Cobras with the 129th, but had not flown any helicopters for many years until he was reunited with our Huey 509 in 2007! 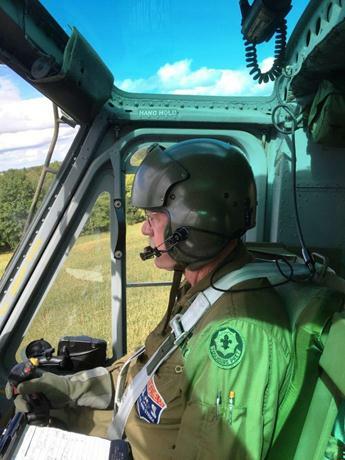 From that day, here in the UK, when he took the controls and flew as if he had been doing it every day, he has been a volunteer, flying Huey 369 at events all over the USA. So, on the Saturday morning, Ron told me I would be flying huey 803 with the 129th guys in the back! I was not expecting that! 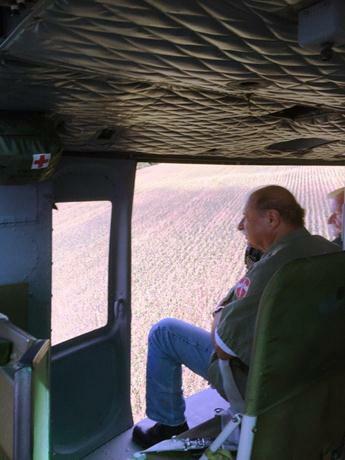 I was strapped in to the left hand seat, with members of the 129th strapped in behind me with both side doors open. It was one of the most emotional experiences of my life. As we lifted off, I had to ask Ron to take controls as I must admit I shed a tear. 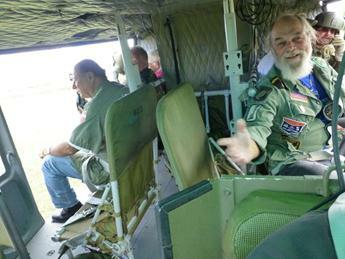 Once airborne and composed, I took back the controls and enjoyed the privilege of flying these veterans once again. 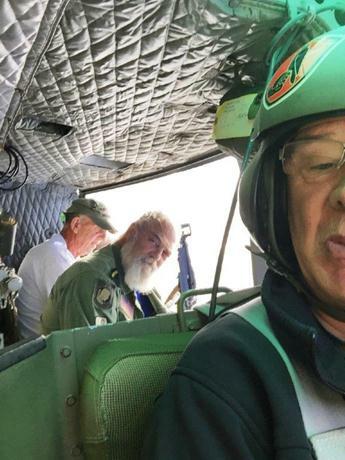 I must give my heartfelt thanks to Ron for allowing me to fly with him and to Johnnie Walker, who is responsible for restoring and maintaining huey369. I landed safely and I hope the guys enjoyed their flight with me as much as I did! Saturday afternoon drew even more people to the event for the final evening. I sat around the fire with Ron and Mark and was presented with a walking stick hand made by "Stick man". He had whittled the stick himself, placed a plastic Huey model on the top and a Huey tail rotor pedal at the bottom! It’s amazing, but I was worried how I was going to get it home! So we practiced taking it apart and rebuilding it until I knew it would fit in my suitcase and that I could get it back in one piece when I got home! It is now taking pride of place in the home of Huey 509 in our hangar. They extended an open invitation to the “No Slack” Living History Group who kindly supports us at some events, to go over and join them at next year’s reunion. I strongly advise that they do! They would have four days they would never forget; meeting the veterans that they represent here in the UK. They would receive a very warm welcome! Unfortunately, all good things come to an end, so Sunday morning dawned. The camps were being broken down and people were heading home. It was time for some emotional goodbyes to friends new and old. 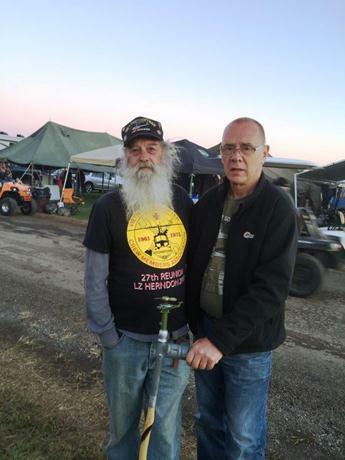 The next Kokomo reunion will be 15th to 18th September 2016. Anyone who has an interest in the Vietnam War should go! You would be made very welcome. Word of warning though; take hankies, alcohol and aspirins! !